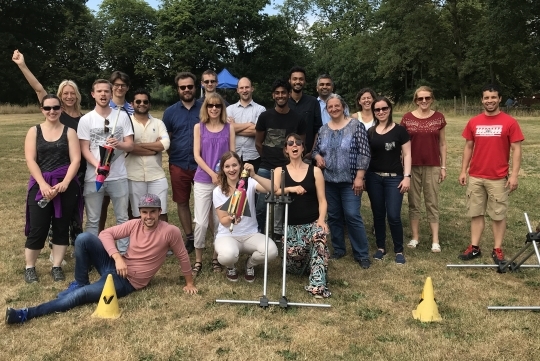 If you’ve never been on team building day, it can sometimes be difficult to understand exactly what the benefits are and how it’s going to have an impact back in the office. You might be wondering, is it really worth the investment? Of course it is! Here’s a run down of what you can expect from a corporate day with us. Here’s our top 5 benefits of a team building day for your employees. Teams who play together stay together! Often our clients have no other objective than to have fun. Well, we certainly like our clients to have a great time with us. FUN is what we do best! What they also leave Ashtree Farm with, however, is a highly motivated team and boosted morale for months to come. Don’t underestimate the importance of your team members knowing and understanding each other. The more quickly they develop as a cohesive team, the better their results and the better the results for the business. Getting people involved in some team building activities can work wonders for team bonding. You’ll find relationships are cemented more quickly than they otherwise would have been. Some team tasks may seem ‘old hat’ but you’ll be surprised how effective even the simplest ones are. Participation in collaborative, problem solving or creative activities, encourages team members to share ideas and listen, before assessing, choosing and implementing the options. Once successfully completed they get to enjoy their shared success. How fantastic! Transfer this improved level of communication back to the work place and everyone is happier. You might be surprised who rises to the occasion when given a chance to shine. There is something about leaving the office environment that creates a level playing field. The prospect may be a little uncomfortable for the more timid members of the team at first, but add in to the mix some good fun and banter and people are more free to be themselves and move beyond what usually holds them back. Some team building activities have specific roles that can be allocated to team members. Mix it up a bit and enjoy the results. Thanking your team is an investment: like anybody you thank, they will feel valued and appreciated. You don’t need us to tell you the benefits this will bring to the workplace. It’s a no-brainer. Just wait and see! What is a typical team building day programme? Depending on the size and demographic of your group, it could be anything from a couple of hours quad biking to a multi-activity day incorporating all sorts of outdoor pursuits. We also love our summer festival event, with activities during the day, a festival style party in the evening and overnight camp in giant tipi’s. All our events are bespoke. If you’d like to see some examples of some other team building days we have run, check out our case studies. We hope you enjoyed reading and we’ve managed to give a broader picture of our events. If you would like to talk about a team building day for your company, please call us on 01732 529511, or find out more about our team activities here.